I’ve got a daily supplement routine too, not quite as many as you but I always take a multivitamin, Vit C & Zinc and Omega 3 6 9 for overall health, and glucosamine & chronditin specifically for joint health – which I think is very important for runners! Yes definitely, I couldn’t agree more. I take the 3,5,9 omega oils specifically for running! Thanks for responding and the great feedback! Personally, I think most supplements are unnecessary. I think healthy foods are far superior as a source of vitamins and minerals. The only exceptions, IMHO, are iron tablets and Glusomine. And unfortunately, taking supplements in large doses may do more harm than good. Thanks Kim for providing a link your site and also the great feedback! You make a great point about taking it in large doses. Can be a lot of strain on kidneys when filtering. I take a fairly moderate approach… I try and eat as nutritious a diet as possible, but from time to time add in supplements to help me “cover all bases”. I definitely agree that supplements can play a vital role in establishing or maintaining health – we give my dog fish oil for his skin allergies and it works a treat, while chondroitin + glucosamine helps my husband’s arthritis. That said, I also agree that supplements should be approached with caution. I believe people waste a lot of money on supplements they don’t need (where their diet provides those nutrients, or the levels of the nutrient provided in the supplement are not therapeutically significant). I also believe supplementing without the advice of a healthpprofessional can be dangerous, with people sometimes taking isolated nutrients for extended periods of time and disrupting the natural balance. I am studying nutrition but would still consult a qualified professional before embarking on any serious regime, or (as I do every 6 months) at least getting blood tests done to check nutrient levels, identify excesses and deficiencies, etc. Thank you so much! This is great feedback especially from someone studying nutrition. You’re right you have to take what works best for you and everyone is different. Supplements can cost a lot of money especially when buying them from distributors or marketers. Thanks again and I look forward to following your blog! 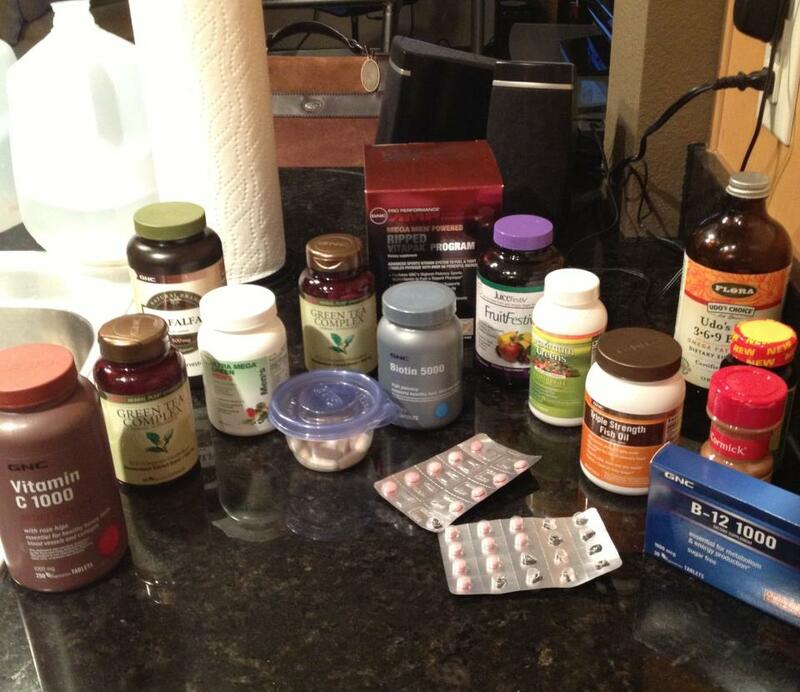 I used to take about 24 pills a day…supplements of all kinds. Today I take a multi-vitamin – Dr. Weil’s – hyaluronic acid (from Purity Products) and calcium/magnesium – 3 pills. And I eat all organic, mostly fruit and vegetables, plain yogurt with wheat germ, oatmeal with almond butter. I’ve lost 42 pounds and feel pretty good,. And so does my wallet. Well first congratulations on your amazing weight loss accomplishment of 42 pounds. And second I think an all organic diet is awesome. I try to eat organic as much as possible but gets difficult to do so sometimes! I agree fruits and vegetables gives us a ton of vitamins and minerals we need! Keep up the great success and thanks for your feedback! I don’t do vitamins. I prefer real food as a matter of principle. I say if someone can get all the nutrients they need from whole foods that’s the way to go! Thank you for the feedback! I just take them when I see fit. I don’t have a certain regimen. If I realized I didn’t eat enough fruit in a day I would take a vitamin c supplement etc!! I take a blister pack that includes a multi-vitamin, a B+C complex, Carotinoid and Fish Oil Complex and probiotic. I’ve been taking supplements off and on my whole life (my family runs a Shaklee business) and I can honestly say that the most significant benefit I’ve seen is in my fingernails. Normally, my nails split and are somewhat soft. With the supplements my nails grow super fast, are strong and don’t split. I agree with your advice about taking vitamins throughout the day due to basic vitamin/mineral/chemical interaction, although if you’re a busy person it can be difficult to remember to take pills throughout the day! Awesome feedback Corinne!! There are true benefits to them and like you mentioned seeing your fingernails get stronger. I noticed the same thing and have seen my skin and hair improve as well! Everyone is different and some may not have the same reaction as we do! Thanks again for responding! Cheap vitamins are a waste of money. I’m a nut about whole food supplements. I especially like New Chapter Organics. It’s an expensive line but oh so worth it (and they are vegetarian which is important to me). Ever since I’ve started using them I’ve been sick less and my skin and hair has been fantastic. So fantastic, in fact, that people who have known me a while have actually commented on the difference. That’s fantastic that you have seen major benefits such as hair and skin. I have also seen the same! I can’t remember the last time I’ve been sick or had to go to a doctor from not feeling good. I read a quote that said let food be your medicine. Ever since then I have eaten whole, natural foods! Thanks again for the feedback. Look forward to hearing from you in the future! I’ve just started a workout routine within the last two months and I’ve been wondering if I should also start taking supplements or protein. MY partner is a vegetarian and I only eat meat once a week or so. Thanks for the run down, I’ll have to look into it some more. Hi Evan! Thanks for stopping by. That is great that you are starting up a workout regimen. I would say you definitely want to make sure you are in taking adequate amount of protein and if not protein supplements may help. I mainly take a multivitamin and fish oils to help my joints due to running frequently! Let me know if I can help further. Does your partner try and get you to become vegetarian? Lol I’m also one but I don’t try a sway people to do so. If they ask about it I tell. I do take supplements and it has helped me in so many ways when it comes exercising. That’s awesome Casie! Keep up the great work and staying healthy! I really appreciate the response. What benefits have you noticed by the way? I move so much better, quicker and my energy is crazy. Wow! Look at you. That is so great to hear. It’s like music to my ears haha. Keep it up! I take suppliments but I admit I am not consistent. I believe as long as a person is eating healthy enough, there is no need to take vitamin suppliments. However, I believe if your body becomes ill, or if your immune system gets a little low, then you should take certain vitamins to help boost you up. For most women over 50, there is the strong possibility of the development of osteoprosis. So to help combat that, calcium and vit D suppliments should probably be taken daily. There are other illnesses that will require suppliments, but your physician should direct you on that. Thanks for the great feedback! You don’t have to consistent as long as you take them when you can. I am not consistent either but if one day I haven’t eaten all my fruit I will take a supplement or two to help aid my nutrition! Thanks again for responding, and having such a positive energy! Iron supplements… always. It I stop taking it, my anemia comes back to dangerous levels. And vitamin c to help iron absorption. Sometimes the body is just not capable of getting the necessary vitamins and minerals despite having a well-rounded and nutritious diet, and depending on the person, that’s when supplements are important. Supplements are not a replacement for meals, but they are necessary when your body severely lacks nutrients. I get really turned off when people look down on supplements because they claim to get their minerals/vitamins from “REAL” food.. honestly, sometimes it’s really just not enough. Everybody is different and functions differently, so to each their own. I take a multi vitamin and from time to time I’ll take a supplement. Nothing beats eating right. I’m not a vegetarian but only eat meat 1x a week so I’ll take an iron supplement. Sometime biotin or vitamin c with flavonoids. I always include a probiotic ! Taking a multi, a C and D.I have gone back and forth on the supplement issue. I look at them as insurance, rather than assurance, that I am getting what I need. And thanks for your like on my blog. Nice job you are doing here! I take supplements too. I don’t see how a vitamin can be negative. I think you don’t really need supplements if you have good eating habits. On the other had, since I stray every now and then, I take a daily multivitamin and fish oil to make sure I’m not missing something. 🙂 It’s a big world out there with a lot of info telling you anything and everything; you approach is a good one. If the supplements work for you, stick to ’em. After all, my lifestyle and eating habits are not yours, so your supplements might not work out that well for me. I take a multivitamin, fish oil, and glucosamine chondroitin. I’ve been taking the multivitamin for years, and the glucosamine made a huge difference when I hurt my shoulder, so I’ve kept taking it. The fish oil I’ve been off and on with. I’m not a fan of the fish burps that can come with it. I take a multi every day and a joint pill. I do not take much else, usually, because I want to get all I need from food. I do take the joint pills because of all my running and I can’t help but worry about my poor knees. Lol. I’m working with a wellness doctor (after a prolonged period of intense stress) and am using a broad range of supplements to “re-set” my metabolism generally and my cortisol levels specifically. While I’m skeptical at best about them as a lifestyle, I can certainly see the benefits of supplements as part of a short-term program to speed recovery. And by the way, thanks for following my blog! You are my 300th follower! There should be some kind of party favor, but I’m afraid all you get is a hearty, and very sincere, thank you. Great post on supplements. Supplements really are a hot button issue and everyone has their own opinion. I personally think that everyone needs to take their own inventory of their diet and assess their personal needs. I personally try to keep it simple and take a women’s multi, omega-3,6,9, and glucosamine every day. They say you are what you eat, but more specifically you are what you assimilate, and you are what you do not eliminate. Before investing in supplements ppl should definitely look at their diet and their digestion first. Are you eating what you need? Are you absorbing your nutrients? Is your diet so acidifying that you are excreting more minerals than you retain? A good Holistic Nutritionist can help you figure things out if you need direction. I take my daily multi and sometimes add more vit D, depending on how I feel. I know that’s the most toxic when overdosed, but I try to keep it within reasonable dosage. I usually look for more natural supplements and only take them sporadically, like BCAA if I train hard and don’t get my shake, or recently started taking glucosamine and creatine on days when I train harder. My joints needed a little extra help for all the weight training, plus I’m bike bound these days, more strain. I also drink Calm powder every now and again. I usually drink it at night, it helps relax my muscles and replenish my magnesium reserves. I try not to use too many supplements, always trying to look for a natural alternative, but when it’s not possible, I still want to make sure I’m giving my body all the nutrients and vitamins it needs to function properly, even during an increased workload. I’m of the belief that one should straighten out their diet before even touching supplements. As in if someone were to ask me about a supplement and I know they don’t eat their vegetables, I would tell them to start getting all their fruits and veggies each day. A supplement can enhance a diet, but it should not be the foundation of it. Which vegan multi do you take? I’m not a religious supplement taker. I’ve taken them over the years but overall I didn’t really feel a difference. I try to eat a well balanced diet along with exercise. I did take a multivitamin while I was training for a half marathon in 3 1/12 wks only because I knew I couldn’t keep up with the all the extra running I was doing. 🙂 After reading this post, I may start taking the multivitamins and fish oil again. I prefer only pharmaceutical grade supplements. I find myself taking fish oil, iron and protein because those are the things I typically don’t get enough of on a daily basis (even if I am eating fish almost every day). I don’t take them every day though, I have an awful memory for that kind of thing. Those are good supplements and I take the same! It is tough to remember to make sure you have eaten all the foods with the right amount of vitamins! Thanks for sharing! Hey, L-Jay…thanks for the follow! Someone above mentioned how informative your blog is…totally agree…just wanted to add to your list of the benefits of cinnamon…I’ve several times read in Runner’s World mag that it aids in muscle restoration post-run, as well! Keep it up! Wow thanks for that! I like to add cinnamon to everything! Are you running any special events soon? Hope to run a few late December and definitely something on New Year’s at the latest….hoping to reach one of the Commitment Day 5k’s (http://www.commitmentday.com/) if possible. Been out of town to support a friend and had to take a week off from running, but ready to get back into it full force! Hmmm I haven’t heard of that one! Thanks for the suggestion I will check it out! having a healthy diet is great, however one must bear in mind that we cannot get all the required nutrients from food alone and therefore have to supplement. i personally am a fan of whey protein, and BBCAs especially before and after working out. A multi-vitamin and omega 3 and 6 supplements are also a must for me. Thanks for the bcaa recommendation Shaun! I’m a big fan of whey protein as well. Which brand do you use? I was on USN’s Whey Protein, but now I use Scientific Sports Nutrition’s 100% whey. check out my post on whey protein for the reason for the switch. OK thanks! I will take a look at it. It is time for me to stock on some more protein! Good topic, but you’re not alone on this one. It’s something a lot of athlete/running bloggers seem to cover at one point or another. Having skimmed through a number (but not all) of the comments on this post, I’m always amazed at the comments about “eating a healthy diet” as being enough. Since most people aren’t nutritionists, how do they define healthy? The other part that kills me is many of the things we eat (especially processed) are anything but. Between the FDA and USDA, much of what we consume has been so tainted with pesticides, radiation, genetic manipulation, etc., that the nutritional value is severely diminished. And, anything that get heated in a microwave, you might as well throw away, as most of the vitamins are destroyed during the process. Like you, I do supplement, although it changes based on need. Given my age (47), I usually take something for the joints, Krill Oil (for the Omegas) and try to cook with the big three – Garlic, Ginger and Cinnamon, where I can, as well as, cayenne pepper for the thermogenic benefits. Thanks Chico! Im all about the big three! Cant go wrong with those. Have you always been into health and fitness? Sadly, no. Like many people, I’ve learned later in life than I should have about taking care of my body. While I’ve made some progress, I have a ways to go. Fortunately, my mother has been a health food ‘nut’ since I was a kid, so I’ve learned a good bit from her, and at the tender age of 77, she still knows her stuff. I believe the multivitamins at Trader Joes are whole food vitamins. Healthy and affordable. I take supplements because I have celiac disease and I am unable to get the nutrients I need from food.